Transactional emails are one-to-one emails that contain information which completes a transaction or process the recipient has started with you. The most common examples are with eCommerce and post-purchase emails; after completing an online purchase, you receive an email receipt with information about the item, price and shipping details. Other examples can include welcome emails and password resets login details, shipping notifications, flight confirmations and cart abandonment alerts (to name but a few). So how do they differ from marketing emails? Marketing emails are generally emails sent where the primary message is commercial or content intended for a commercial purpose and are usually sent to groups of contacts that are either prospects or customers. Additionally, marketing emails are generally sent in bulk, whereas transactional emails are sent to individuals. 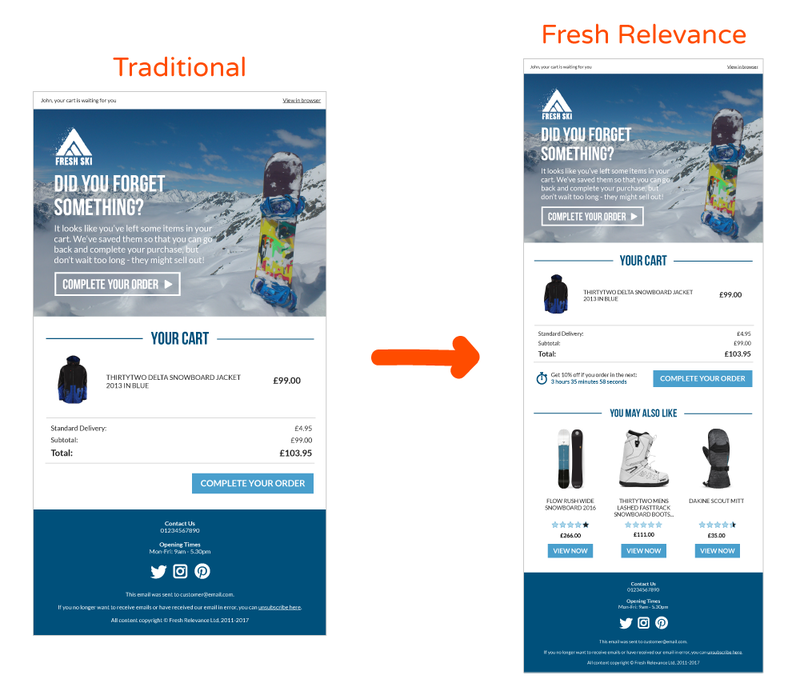 Transactional emails are generally sent following a purchase, so they are not usually intended to increase sales directly, but are a tactic to deepen engagement. They are relevant to each individual recipient. 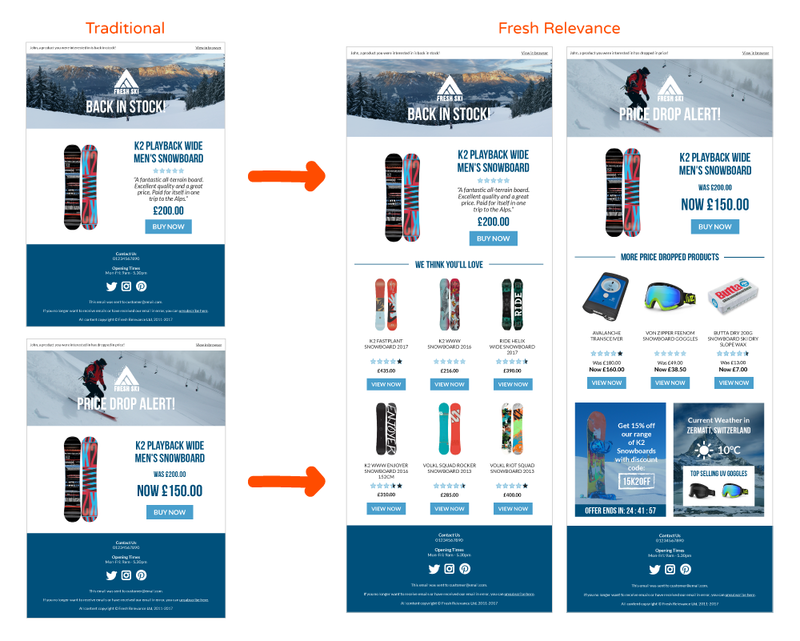 Research has shown that transactional emails have 8x more opens and click-throughs than any other type of email and can generate 6x more revenue. This means marketers are missing out on a huge opportunity here! Similarly to marketing emails, marketers should be using transaction emails to help drive people back to your site and buy more from you. Here's a list of 5 useful types of transactional emails that can help grow your business (Click on the images to view the full email).The image on the left-hand-side examples the traditional (boring) way of sending transaction emails. 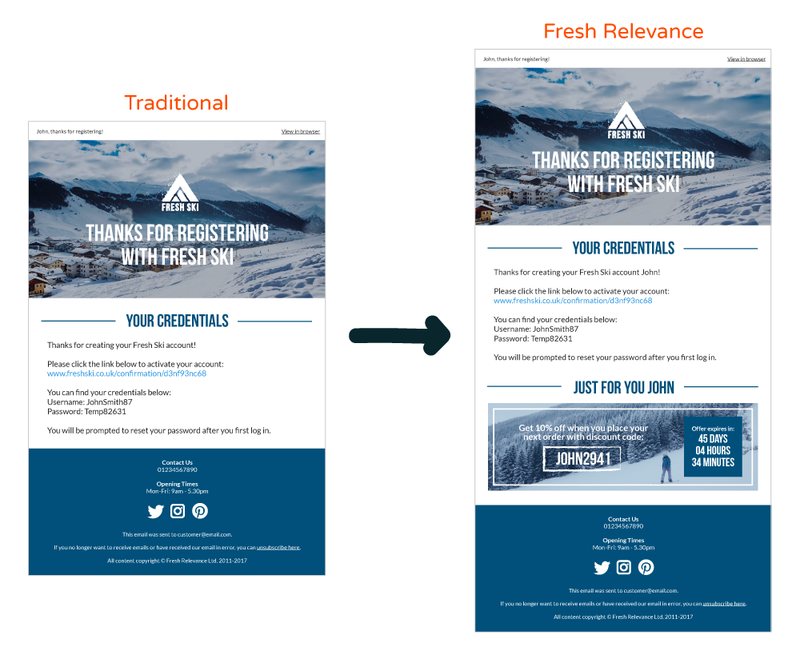 The right-hand-side email is how Fresh Relevance features can spice up your transaction email marketing! These are sent when a user first creates an account on your website. In order to optimize registration emails give your customers a helping hand with their credentials by including their username and password (if safe to do so). The shopper is clearly already interested at this point or they would not have signed up/registered, so make them even more intrigued by adding a Coupon and Countdown Timer to increase the sense of urgency to purchase. Send notification emails when a relevant action or event takes place. These could include password reset emails, back in stock alerts or price drop alerts. Include relevant, personalized information as this helps the customer identify the exact action they need to take. Provide a clear next step and ensure the design of these emails are aligned with the rest of your branding and marketing. Improve your notification emails by adding Product Recommendations, Weather Forecasts and Coupons. Sent to notify a customer when a specific action has been completed, confirmation emails can come in many different forms. They can include flight, hotel or holiday booking confirmation, festival or concert ticket confirmation or just simple online shopping confirmation. 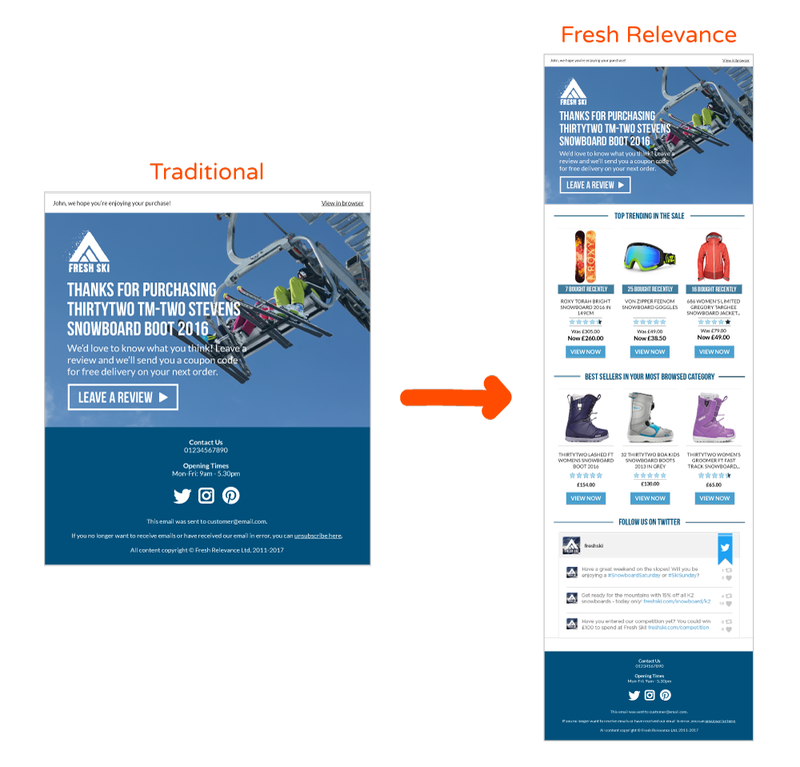 Ensure these emails are optimized for mobile, as that's where they'll more than likely be opened. Include all relevant information: dates, times, address, booking reference and a ticket attached if needed. A great way of further enticing customers in a confirmation email is by offering a 'complete the look' section. Finish this email off with Social Media SmartBlocks to promote further engagement. Feedback emails are pretty self-explanatory: they're sent when you’re requesting feedback from a customer. These are your opportunity to request reviews and ratings for your product, flight, service etc. Make sure you provide context in these emails - what product are they supposed to be reviewing? Attach product description and images where possible, and add a prominent call-to-action with clear, simple instructions to ensure a high response rate. Add Social Proof to feedback emails to show other customers have also left feedback. Again Product Recommendations and Social Media SmartBlocks work great in these emails. Last and most definitely not least, these are sent when a customer has left your page before completing a purchase. These emails could include Personalized Welcome Banners, Coupons or Countdown Timers. 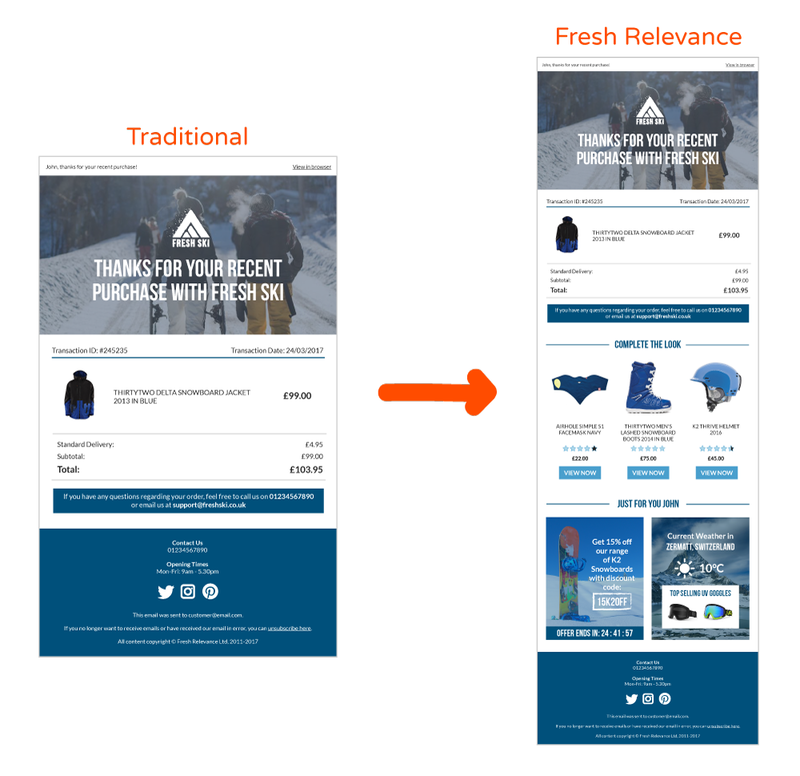 Pull in the shoppers' cart summary from your website to remind them what they've left behind, and add Product Recommendations to further entice them. Like what you see? Request a demo with one of our team to find out how you can spice up your transactional email marketing!